LGBTQI+ people with an Autism Spectrum Disorder have two separate rainbows — and two separate coming out stories. There are times when an autistic will not come out as LGBTQI+, and vice-versa. The challenges for each minority group are great, and being a double-social minority can be especially tough. Education and peer support goes a long way in helping to navigate these challenges, and make for a smoother trip on the social highway. That’s the premise of Twainbow — people living under a double-rainbow. Corey lives under the double-rainbow and works for a nonprofit in Eugene, Oregon as a Life Coach (Direct Support Professional) to Individuals with Intellectual and Developmental Disabilities. Louis lives under the double-rainbow and is an executive operations consultant. He founded the consulting firm Kiraly Molnár Jansen and is an author, artist, former elected official and professor emeritus. Tony lives under the double-rainbow and advocates for the rights of LGBTQI+ individuals in Africa and the Netherlands. He is proficient with many desktop and web applications, and other technologies. Autism is a short way of saying “Autism Spectrum Disorder,” which is another way that the brain developments. Its expressed in many areas including social communication skills, fine and gross motor skills, and sometimes intellectually as well as unusual responses to sensory input (unusual sensitivity to light, sound, etc.). According to the latest update to the DSM V in 2013, autism is a “spectrum disorder” although it is best described as a neurodiversity. Until May, 2013, there were five different autism spectrum diagnoses. At one end of the spectrum was Asperger Syndrome, sometimes called The Little Professor syndrome. At at the other end of the spectrum was autistic disorder, known for profound developmental delays and challenges. ​Anyone with neurological expressions consistent with autism will receive an ASD diagnosis — along with a functional level (1, 2, or 3) and, if appropriate, specifiers. Some common specifiers include cognitive disabilities, seizure disorders, and so forth. Autism awareness or autism acceptance? Awareness has to do with knowledge, and acceptance has to do with social integration. At Twainbow we are working on both fronts: from research and education programs to community liaisons, our goal is to advocate for those under the double-rainbow through education and outreach. We want to blast through ignorance and bring people of the entire neurodivergent spectrum together. 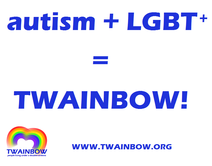 At Twainbow we recognize that a schism exists between many autistics, the healthcare field, and autism organizations. One of our goals is to share experiences from the perspective of the LGBT+ autistic so that the science of neurology can better understand what it means to be autistic. In this way science and society will continue to evolve its position on autism from a treatment perspective to one of recognition of neurodiversity as simply a difference. This is why we support the use of the infinity sign over the well-known symbol for autism, the puzzle piece, since the puzzle piece may infer that autistics are incomplete or have something missing in their brains. Queer – An umbrella term which embraces a variety of sexual preferences, orientations, and habits of those who do not adhere to the heterosexual and cisgender majority. Traditionally this term is derogatory and hurtful, however, and many people who do not adhere to sexual and/or gender norms use it to self-identify in a positive way. Ally – A person who does not identify as LGBTQI+, but supports the rights and safety of those who do.